Google Music Beta is one stop online music hub for songs playback. We have already seen easy procedure to upload and add songs to Google Music Beta. It supports variety of popular music file formats and hence you can upload music without worrying about the format. However, you can still quick check following for supported and non-supported music file types for uploading music songs to Google Music Beta service. You can upload music in these Google Music beta supported file formats including: MP3, AAC, WMA, FLAC with file extensions .mp3, .m4a, .wma and .flac respectively. 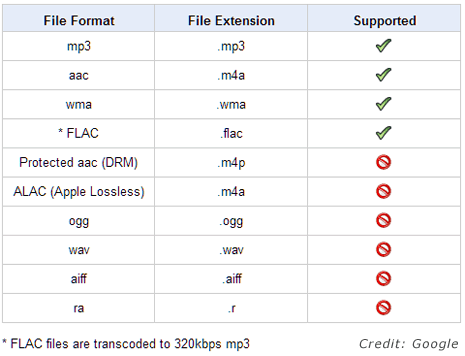 Music file formats not supported by Google Music Beta includes: Protected ACC DRM, ALAC (Apple Lossless), OGG, WAV, AIFF, RA with file extensions .m4p, .m4a, .ogg, .wav, .ogg, .wav, .aiff and .r respectively. So before you upload any music files to Google Music Beta account make sure you check on its file format. If you attempt to upload songs with un-supported file format – it wont upload and fail. In such case, you can convert un-supported file format song or music files into different music file formats supported by Google Music beta. For example: you can easily convert WAV to MP3 and hence easily upload WAV files (which by default is un-supported) in the form of MP3 file. Also, you may use free audio format converter software to convert other music file formats into formats supported by Google Music Beta.